Touring is not a sprint. It’s a long, tiring and exhausting marathon. But if you end up at home the payoff is worth it. Don’t believe me? Just ask Wilco. Moving from smaller venues like the Aragon or Auditorium theatre, Wilco played an arena in Chicago for the very first time. The UIC Pavilion presented a new dynamic to their pioneering mix of alt-country, rock, and pop-folk ballads. It wasn’t as cozy as previous shows, but the spacious sports complex gave fans plenty of room to stretch out — although those on the main floor clumped closely towards the stage for maximum intimacy. A gorgeous moment blossomed during “Jesus Etc.” when Tweedy let fans handle most of the vocals. They filled the Pavilion like they had been with Wilco for the whole tour as a traveling choir. Tweedy loved the fans’ performance and created a bit of good-humored animosity saying, “This night’s crowd is far superior; [it’s] as if last night’s crowd didn’t even know the words.” Later he also tossed a Wilco (the Album) LP into the crowd — that was instantly snatched up. For two hours it was vintage Wilco. And aside from the “new” songs, the show didn’t present anything that I haven’t seen or experienced at a Wilco concert before. But still, it was nothing short of superb. And I’m starting to wonder if Wilco will ever play a bad show. Because after seeing them on this tour there are a lot of reasons why I’d consider them one of the best live bands today, if not the last ten years. Like on the new album, there weren’t any big surprises or jarringly new songwriting explorations. Yet what makes Wilco such a subtle yet overpoweringly excellent live band is their mix of musical precision, chemistry, and warmth. Tweedy weaves joy, misery, and hope into one verse and finds ways to interact with the fans by just being his goofy, quirky, and lovable self; meanwhile, Glenn Kotche (one the best drummers playing today) and the others players embrace the low profile and continue to sharpen and explore their craft. The fact that they’ve been at it for 15 years (the current lineup for four years) is testament to the fact that they don’t see touring and making music as a sprint, but a marathon. With another solid album behind them and the live show nearly mastered, I wonder what’s next for Wilco. Will they continue with all the current members? 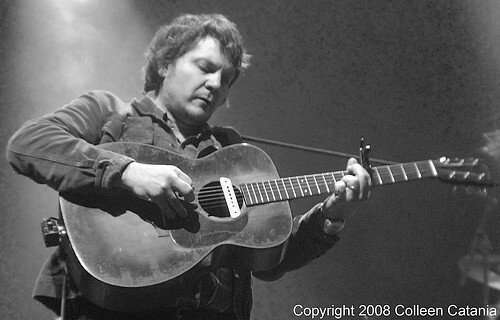 Will Tweedy experiment with a new songwriting style? Will Kotche still have that a massive gong behind him on the next tour? Whatever they do and wherever they take the next album, I’m sure that old fans will follow and new ones will be gained too. And maybe they’ll fill up the UIC Pavilion on both nights the next time around.